The creation of "economically significant" planning zones was discussed in the assembly on Monday, as part of proposed amendments to a new planning bill. She said it was "another example of how the Sinn Féin-DUP junta does business" and that it was "all contrary to the Good Friday Agreement". Ulster Unionist Danny Kinahan said that, like many other people, he was "shocked, horrified when we saw the amendment". Basil McCrea of NI21 said that "they are at a single stroke going to do away with the Department of the Environment". "War has been declared on this assembly," he said. The TUV's Jim Allister likened the amendment to an ambush on the environment minister and said it had to be "the most audacious power grab this house has seen for a long time". Mr Allister called on the parties opposed to the amendment to quit the executive" and force the issue of opposition in this house". Anna Lo of Alliance, who chairs Stormont's environment committee, said she was "shocked" when she read the amendment to the planning bill. Ms Lo said it would give the DUP and Sinn Féin "the green light to approve fracking in Fermanagh" and said her party would oppose the amendment. However, Sinn Féin's Cathal Boylan said it was a measure aimed at "growing the economy" and would not pave the way for fracking. 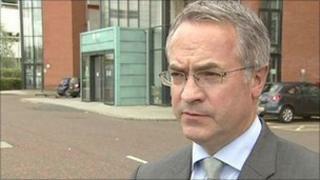 Mr Boylan said it was about creating jobs and "trying to keep our young people here". The DUP's Simon Hamilton said the amendment represented "another arrow in the economic quiver of Northern Ireland". Mr Attwood quoted from part of the economic pact agreed between Downing Street and OFMDFM earlier this month, which stated that: "The executive will establish a new process for economically significant planning applications and make new arrangements in relation to applications for judicial review of planning decisions". The SDLP minister questioned whether London should be able to use Northern Ireland "as a place to sample and test new law when it comes to significant planning applications and JRs (judicial reviews)".